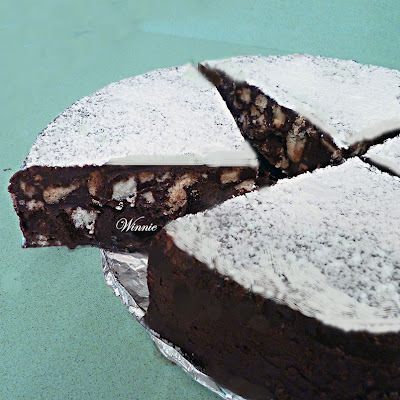 When I was growing up, it seemed that the last thing I wanted was a homemade cake for my birthday. Somehow, storebought cakes seemed ten times better. Granted, our idea of "homemade" was something out of a box. But, the funny thing is that the storebought cakes weren't much better in reality. They were always dry, so-so in taste, and they all came with some sort of awful custardy filling. But, when you're a kid, all you care about is that the storebought cake has those pretty, super sugary roses on top. 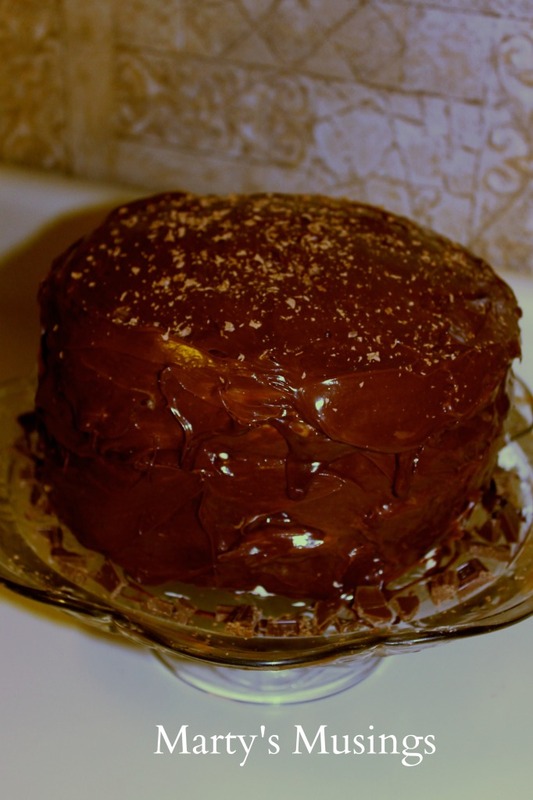 Now that I'm older, I desire the finer things in life, and that means a homemade cake that is truly homemade. So, when a family member of mine had a birthday coming up, I started Pinterest-ing like crazy to find a cake that just screamed, "Make me!" And, what I found was a lovely Lemon Strawberry Layer Cake with Lemon Cream Cheese Frosting on Baked Been's blog. I did make a couple changes though. I didn't have any strawberry jam to fill the cake with, but I did have a jar of raspberry jam in my fridge, which you know goes perfectly with lemony flavors. Of course, I didn't have any lemons either, but I had a bunch of limes, which is close enough for me. So, my cake became a Lime Raspberry Layer Cake with Lime Cream Cheese Frosting. The cake itself is a basic 1-2-3-4 cake, which, believe it or not, I've never had before. You can bet I'll be having it a lot more from now on because it was the best cake ever. 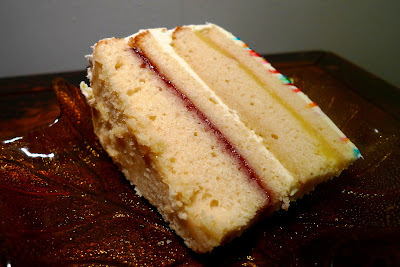 So simple to put together and, because it's a denser cake, it was super easy to slice into layers. Not to mention that beautiful tight crumb, the moistness of it all, and a subtle flavor that makes it perfect for pairing with the stronger flavored fillings like lime curd and raspberry jam. One bite and I was in cakey heaven. From now on, when I need a vanilla birthday cake, this is going to be my go-to recipe. Buh-bye boxed mixes and buh-bye storebought cake! Preheat oven to 350 degrees Fahrenheit. Grease and flour two 8-inch cake pans. Cut out a circle of parchment paper to fit inside each pan and grease and flour the parchment paper. Melt the butter in the microwave or in a saucepan. Combine the melted butter and sugar in a bowl. Add in the vanilla, then the eggs, one at a time, and beat until fully incorporated. Combine the flour and baking powder. Add half the milk, then half the flour mixture, then the rest of the milk, and the rest of the flour mixture, beating after each addition. Divide the batter into the cake pans. Bake 25-30 min. 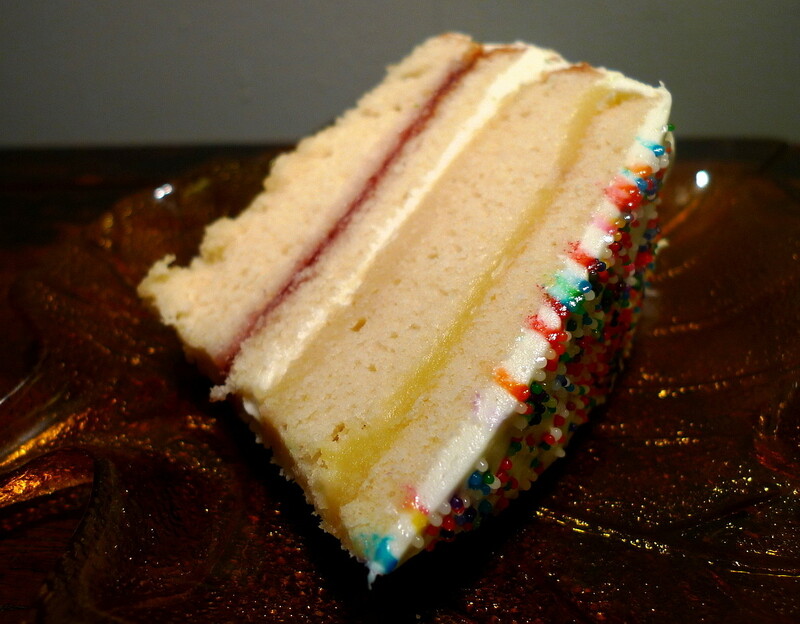 until a toothpick comes out clean when inserted into the center of the cake. Let cake cool for 10-15 min. before removing from the pans. Set out onto wire racks to cool completely for another 30 min. before slicing in half, horizontally. 5. Immediately press the curd through the strainer. Put into a bowl and chill in the fridge for at least 1 hour before using to fill the cake. Beat the cream cheese with the butter until smooth. Add the zest and juice. Beat in the powdered sugar until fluffy. Put one layer of cake onto a plate. Spread evenly with the raspberry jam. Top with a second layer of cake and spread with some of your cream cheese frosting. Top with the third layer of cake and spread evenly with the lemon curd. Top with the final layer of cake and frost the top and sides with the rest of your cream cheese frosting. Decorate as desired. It just so happened that I had two apples in my house. Now, what should I do with those apples? Should I eat them? Well, I could, and that would be wonderful. But, why eat them when you can bake with them. I've had this Harvest Apple Challah on my mind forever and I decided that now was the perfect time to make it. 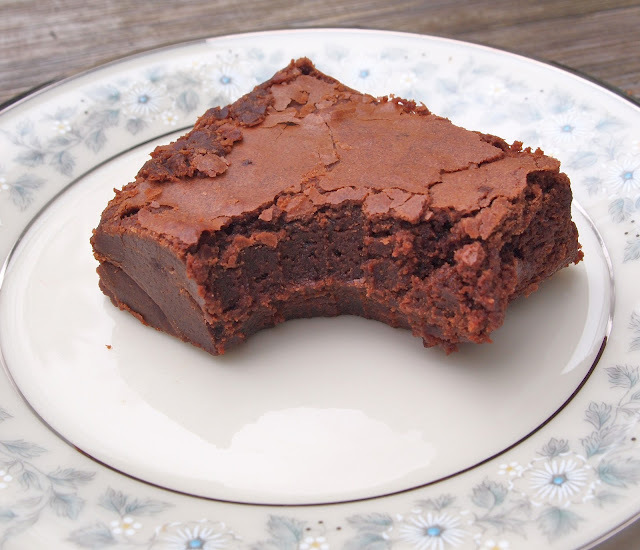 The King Arthur Flour website (love that site!) where I got this recipe has some great pictures on how to go about making it and you should really check it out if you decide to give this a try. 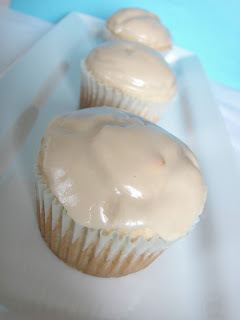 I made a few changes like substituting brown sugar for the honey and adding more cinnamon, but other than that, I kept the recipe pretty much as is. 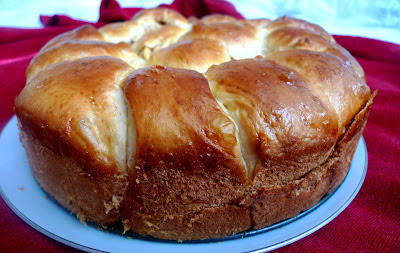 The bread, when baked, is a thing of beauty - all golden brown, soft and fluffy, with apples tucked in here and there. It's definitely a healthy bread that you can eat for breakfast since it's not sweet at all, with the exception of the apples adding their natural sweetness to each bite. The King Arthur Flour website also recommended drizzling it with honey before eating, which I tried and I recommend you do the same. The only thing I didn't like was that the apples were still on the crunchy side even after baking. That's fine if you like that sort of thing, but I kind of want my apples to be more tender, so I might cook the apples a little next time before tucking them into the dough. But, even though I felt it could use a little improvement, that still did not stop me from eating this every chance I could. What can I say? The carbs called out to me. Combine the yeast with the water and a pinch of sugar. Let sit until foamy, about 5 min. Combine the yeast mixture with the melted butter, the honey, and the eggs and stir well. Add 1 cup of flour at a time and mix until the dough no longer sticks to the bottom of the bowl. Knead the dough for about 6-7 min. until it is smooth and elastic. (I ended up using about 2 3/4 cups of flour to start and kneaded in 1/2 cup more.) Place the dough in a greased bowl and turn to coat the dough. Cover with plastic wrap and a dishtowel and let rise for 2 hours, or until it's puffy and nearly doubled in bulk (mine took 1 hour). Lightly grease a 9" springform pan. Toss the apple chunks with the sugar and cinnamon. Gently deflate the dough, transfer it to a lightly greased work surface (I used a buttered piece of parchment paper taped to my kitchen table), and flatten it into a rough rectangle, about 8" x 10". Spread half the apple chunks in the center of the dough and fold the short side of the dough over the apples to cover it, patting firmly to seal the apples and spread the dough a bit. 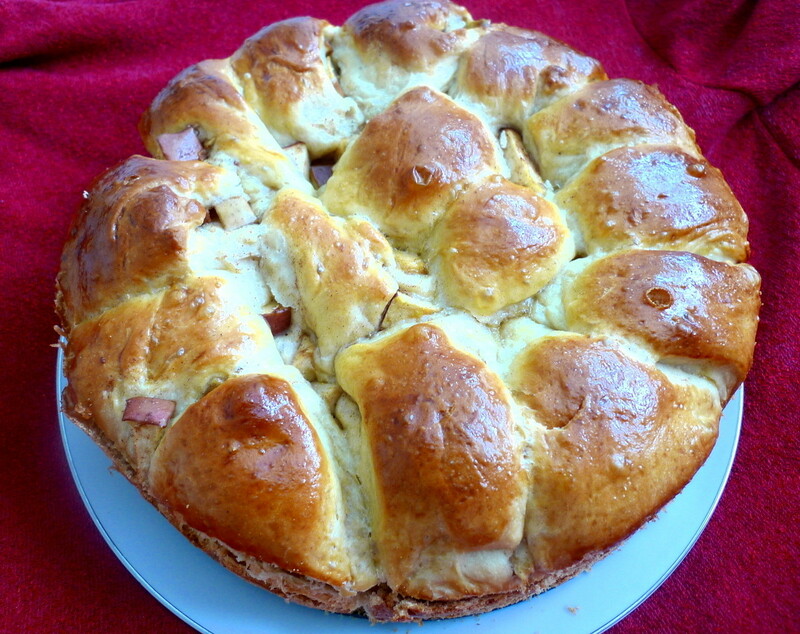 Spread the remaining apples atop the folded-over dough. Cover the apples with the other side of the dough, again patting firmly. Basically, you've folded the dough like a letter, enclosing the apples inside. Take a bench knife or a knife and cut the apple-filled dough into 16 pieces (i.e. cut it in half first, then cut each half in halves and so on until you have 16 pieces). This will be very messy; the dough is slippery, apples will fall out, sugar syrup will ooze, but just keep going all the same. Lay the dough chunks into the pan; crowd them so they all fit in a single layer. If any apple chunks fall out, simply tuck them in among the dough pieces or spread them on top. Cover with lightly greased plastic wrap and allow to rise for 1 hour, until it's a generous 2" high. Towards the end of the rising time, preheat the oven to 325F. Whisk the egg with the water and brush the dough with this mixture. 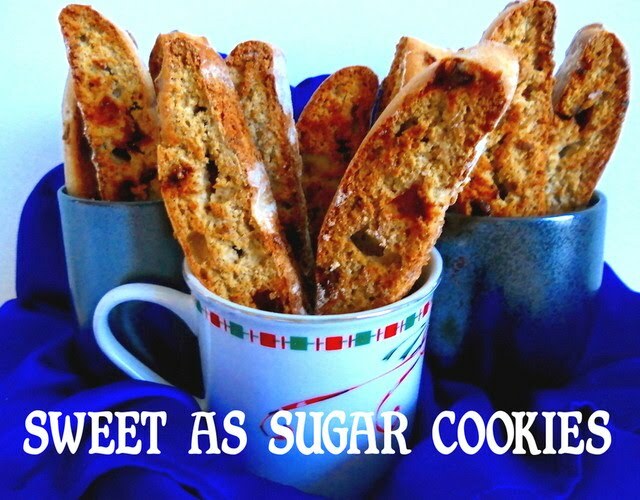 Sprinkle with coarse sugar, if desired, or omit if you intend to drizzle the bread with honey before serving. Place the bread in the lower third of the oven. Bake for 55 min., or until the top is at least light brown all over, with no white spots. 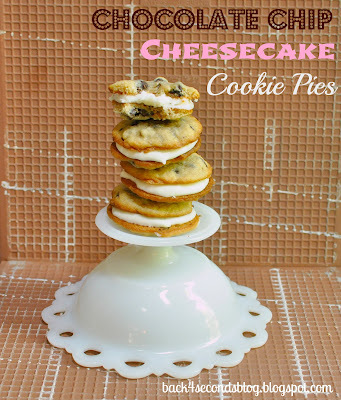 Remove from the oven, and after 5 min., loosen the edges and carefully transfer it to a rack. Super rich = super yummy. Good to eat and good for you. What do you do when great fruit comes on sale? For instance, let's say peaches for only 49 cents a pound? Do you rush to the store, buy 10 pounds of it and start making a list of all the delicious things you're going to make with it? Because, let's face it, when it's that cheap, you don't have to use it sparingly. You have full permission to go crazy, which is exactly what I did. This is a time that only comes around once a year and I wait for it with excitement. 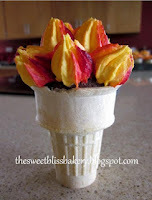 My head is spinning with the idea of making quarts of peach sorbet and peach sauce again, as well as trying out all sorts of new peachy keen recipes, which I've been pinning like mad. 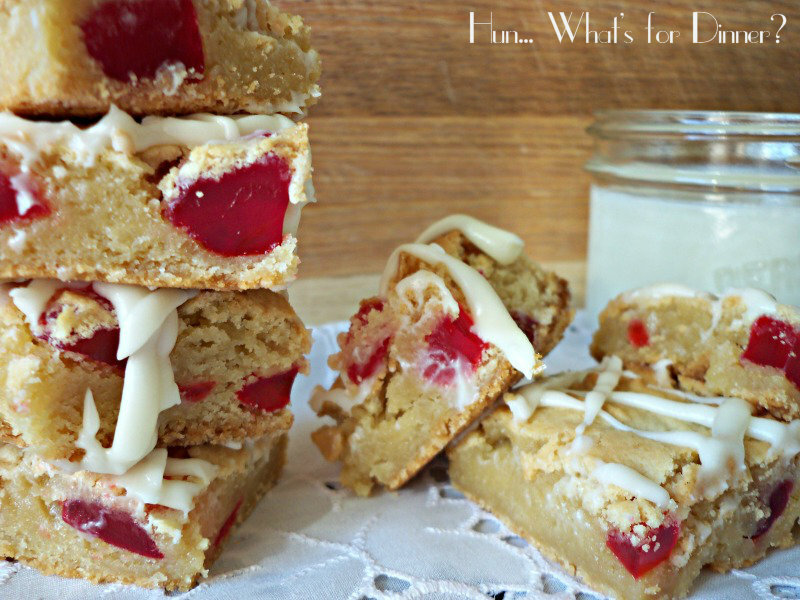 Which brings me to this recipe for peach pie bars that I saw on Pink Parsley. 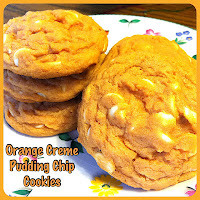 The idea of a creamy, sweet, tangy, peachy filling sandwiched between a buttery crust AND topping (gotta have topping!) just made my mouth water. And what with those pounds of peaches on my counter just begging to be used, I knew this would be the way to go. I did make several changes to the recipe. For one thing, I decided to spice up the crust and topping with some cinnamon, ginger powder, and nutmeg. Then, I used some brown sugar in the filling and increased the cinnamon. I also used Greek yogurt in place of the sour cream since that's what I had on hand. 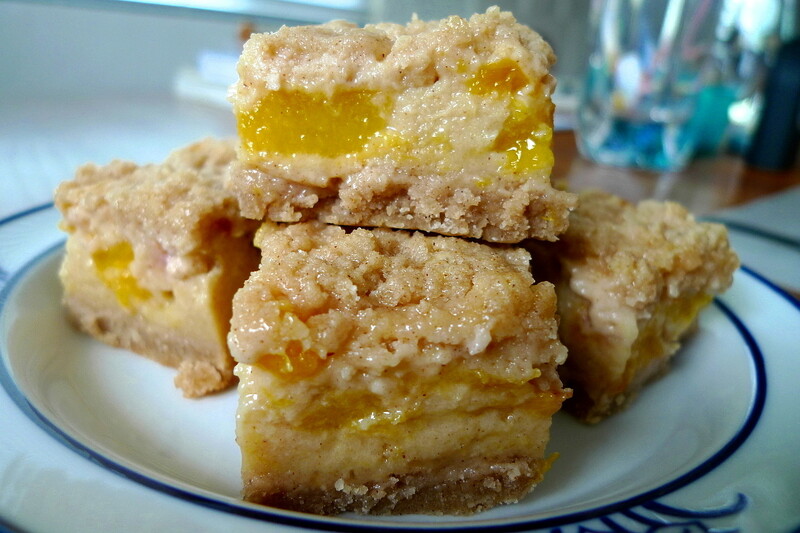 These peach pie bars were OMG good!!! The best way to describe them would be a layer of crust on the bottom, then a thick custardy layer (almost like a clafouti), then a creamy peachy layer, all topped with a crackly cinnamony-sugary crust. And even then, that description does not do it justice in terms of how delicious this is. I'm definitely glad I spiced things up and would probably add even more spice next time. So, if you've got peaches somewhere in your house, put them towards a worthy cause and make these bars! Preheat the oven to 350F. Line an 8x8 inch baking pan with parchment paper. Combine the flour, sugar, salt, and spices and whisk together. 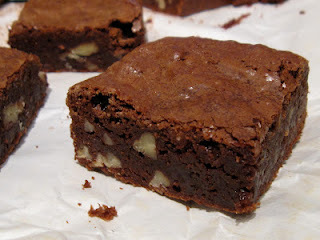 Cut the butter into 1/2" cubes and cut into the flour mixture with a pastry cutter until the mixture is crumbly. Reserve 3/4 cup of the mixture to use as the topping. Press the remaining mixture into the bottom of the pan and bake 12-15 min. Cool for at least 10 min. To make the filling, whisk the eggs in a large bowl, then add the sugar, brown sugar, yogurt, flour, salt, cinnamon, and vanilla extract. Gently fold in the peaches and spoon the mixture over the crust. Sprinkle the remaining flour mixture (I kept this chilled in my fridge until I was ready to use it.) evenly over the filling and bake 45-55 min. Cool at least 1 hour before cutting into bars. For this month's Secret Recipe Club, I was assigned to Kate's blog, Kitchen Trial and Error. You can bet I spent a good part of a night browsing through the many recipes on her blog and making a list that was like half a page long. I finally settled on making her recipe for Chocolate Peanut Butter Layer Cake. After all, it's chocolate, it's peanut butter, it's awesome! But, since I intended to give this a group of teenage girls, and I wanted it to be more portable, I opted to make them into peanut butter filled chocolate cupcakes instead. Let me just say, the cake itself was delicious - chocolatey, fluffy, and moist. Then, you've got this peanut butter filling. I'm warning you, do NOT take a taste of it until you've finished filling the cupcakes, because you might end up eating the whole bowlful and not having any left. 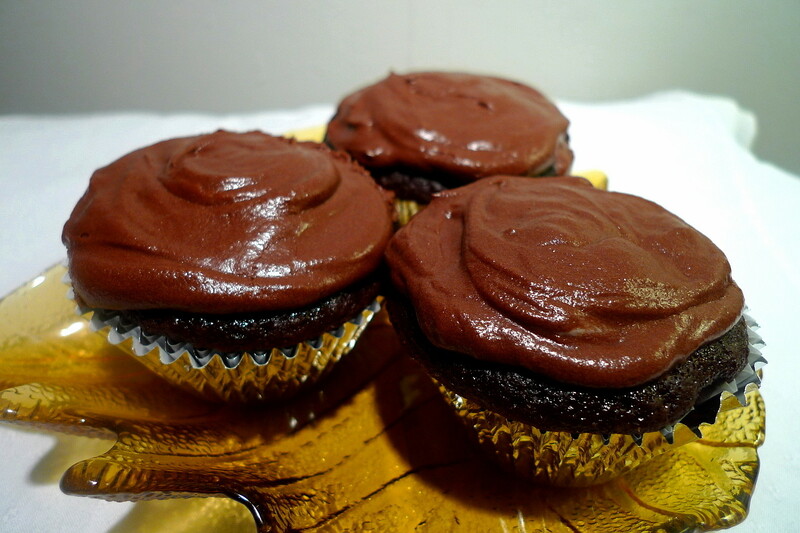 Drizzle the cupcakes with luscious chocolate ganache and you'll have the best chocolate peanut butter cupcake in the world. I am so glad I chose this recipe. Oh, and in case you were wondering what happened to those little cake parts that were removed to make room for the filling . . . *mmmfff mmmff* . . . I'm not saying. In a separate medium bowl, mix the buttermilk, oil, eggs, and vanilla. Slowly add the wet ingredients to the dry ingredients until incorporated. Slowly mix in the hot coffee or water. The batter will be very thin. Fill each muffin cup 3/4 full with batter (it'll make 10 cupcakes in all). Bake for about 20 min., or until a toothpick comes out clean. Cool completely before filling. 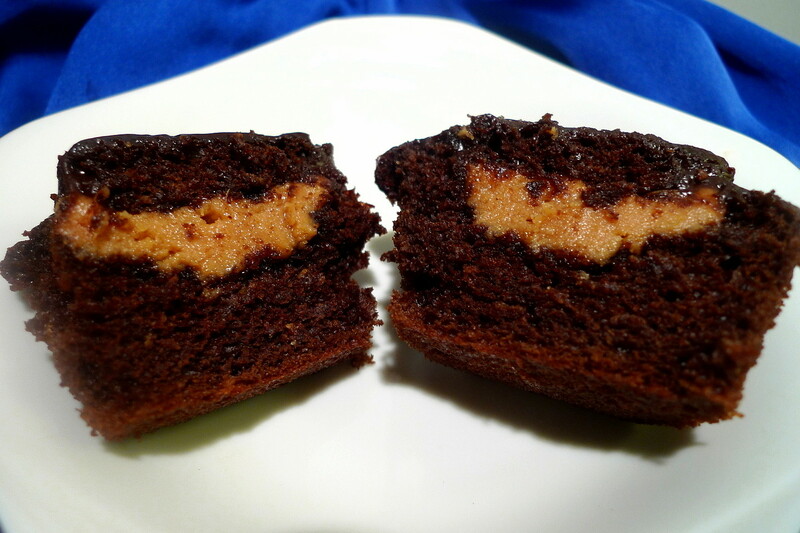 Combine all the ingredients for the peanut butter filling in a bowl. The mixture will be very thick. When the cupcakes are cool, cut a small cone out of the top of each one with a serrated knife. Form the peanut butter filling into a 3/4"-1" ball and put into the space in each cupcake. Top with a little of the cake cone you cut out. 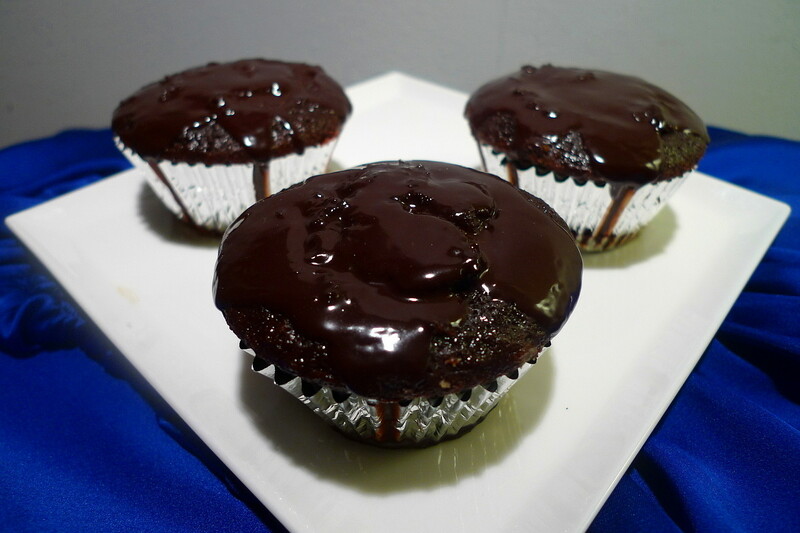 Slowly pour the hot ganache over each cupcake, letting it naturally spread to cover the cupcakes. Let the ganache set before cutting and serving. Note: I glazed half of the cupcakes with the ganache and decided to top the other half with chocolate buttercream frosting. Either way, it's absolutely delicious.